A century ago, as the horrific “War to end all wars” dragged on, a daring young sportsman from Baltimore, named Francis Warrington Gillet, set his sights on throwing in with the Allied cause. By Armistice Day, the flying ace, who was known to his comrades as “Razors”, was officially credited with downing 20 German aircraft – a number second to only the wildly acclaimed ace: Eddie Rickenbacker. Last night, members of the Western Front Association, East Coast Branch (USA), were joined by descendants of Captain Gillett, diplomatic representatives of Great Britain, Belgium, and France, and other invited guests, in honoring Gillet and his fellow service members with the unveiling of a painting, titled “Maryland Over Flanders”. 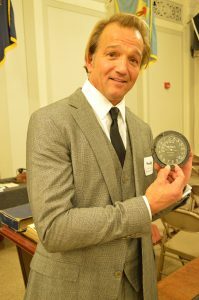 The dedication ceremony took place at the War Memorial Building on North Gay Street in Baltimore. Paying tribute to Captain Gillet were Paul Cora, President of the Baltimore Chapter of the Western Front Association; Colonel Robert J. D’Alessandro, Chairman of the United States World War I Centennial Commission; David Craig, head of the Maryland World War I Centennial Commission; and Alan Walden, former mayoral candidate and news commentator at WBAL-AM. Representing the family were Francis Warrington Gillet III and his son, Francis Warrington Gillet IV. 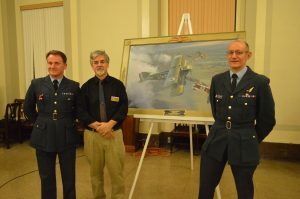 The Western Front Association East Coast Branch (USA) commissioned noted aviation artist Michael O’Neal to create the commemorative painting for permanent display at the War Memorial Building. 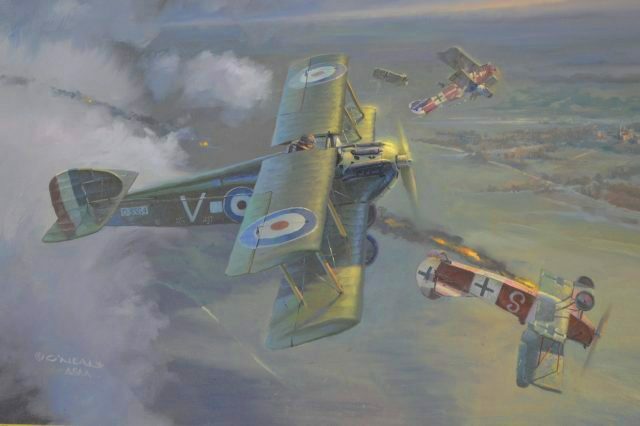 O’Neal’s stunning work – rendered in oil on Belgian linen – depicts Gillet’s Sopwith Dolphin fighter emerging from the clouds with two German Fokker D.VII’s falling away on either side. The painting – based on an actual event – recalls a harrowing dogfight Gillet won near the end of the war. We asked O’Neal about his decision to render the painting on Belgian linen. More than 62,000 Maryland men and women (including some 11,000 African-Americans) served in all branches of the service during WWI. National Guard units and inductees made up portions of the 29th “Rainbow” and 79th “Blue & Grey” divisions. Maryland also supplied doctors and nurses (many from Johns Hopkins) to the war effort – both in Europe and at home. (Fort McHenry was converted for use as U.S. Army Hospital Number 2). America had just entered the war when Gillet graduated from college in the spring of 1917. Impeded by his youth from becoming an officer in the U.S. Army, Gillet was discharged by the army, then crossed the border into Canada and volunteered for Britain’s Royal Flying Corps. He received his pilot’s wings in December 1917 and began to train on the Sopwith Dolphin – a sturdy but unusually designed negative stagger-winged bi-plane. Once thrown into combat, Gillet saw action over France and Flanders (Belgium) with No. 79 Squadron, RFC (later the RAF) from March 1918 until the final shots were fired on November 11, 1918. It is said that when the war was done, he walked over to his beloved airplane and cried. Francis Warrington Gillet III was only ten when his famous grandfather passed away in 1969. He recalls his grandfather, who remained in Baltimore after the war, as a warm and loving family man. Gillet III said the trophies on the wall spoke to two aspects of his grandfather which he believes helped him survive the war. One was his keen eyesight. The other: a true marksman’s skill – honed while hunting waterfowl along the shores of the Chesapeake Bay. We asked Francis Gillet III if Captain Gillet ever talked about his service during the war? “You know, you really don’t get into it with a child – how you were a star and killing Germans in the Western Front. Or how you were an American flying for the British. It’s very confusing for a child. He was just a great guy, and I still can’t believe that I knew him. “He was known for the Distinguished Flying Cross, which he received from the King of England. He also received the Croix de Guerre from the King of Belgium and the Bar to go with the Flying Cross. It’s believed that he shot down 33 planes, but he is credited with 20 confirmed. It was difficult to get a kill confirmed, because you needed a witness on the ground to corroborate a crash, and many of his battles occurred behind enemy lines. Gillet’s final conflict was the basis of the painting executed by Michael O’Neal. “Paul Cora approached me about doing a painting in honor of Francis Warrington’s joint service during World War One,” explained O’Neal. “Paul did what I love in a commission: he said, ‘Find out a little about the guy, then pick a day or an event that you think would make an exciting painting, and let me know when you are done.’ I picked the 10th of November, which was the day before the end of the war, and it was an unusual event. Gillet’s bravery in the face of battle may have faded from memory in the hundred years since the end of the war. 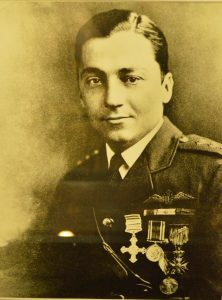 But with the centennial fast approaching, the time has come to commemorate him and the countless others who fought and died in World War I. Gillet was a genuine hero at a time when air combat was in its infancy; a time when a pilot could still literally look into the white of his enemy’s eyes. owls want such eyes to pierce the nights unknown. the power of the leviathan’s my own. nor still the silent heights my mighty drone. I soar the skies and rise and rise alone. I try my strength as might old Thor the strong. and shout at heaven’s high gates a man-made song.